I love my family. They are quirky and wonderfully weird without even realizing it. For the most part I'm used to it; It's the itchy sweater phenomena, at first it drives you crazy but after awhile you hardly notice. Every now and again though, I am reminded. This time of year especially. You see, my parents have interesting taste in Christmas trees. Growing up, it was a bucket full of WTF every year. 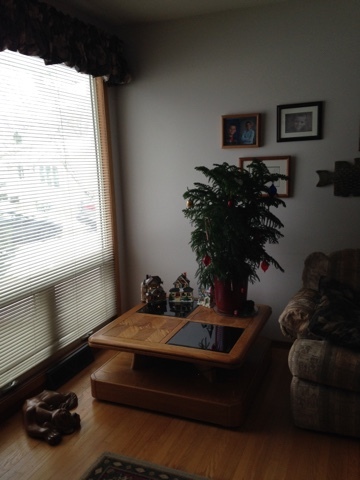 One year we had the Christmas birch, another the festive fern. The first time Brad celebrated Christmas with my family was the fern year. I'm pretty sure he questioned what he was getting himself into. Last year my parents put up a fake tree. It's funny, but for them that IS weird. Prior to the decorations going on I was surprised but then they covered it in about 20 full size teddy bears. Just when you think they took a year off from the quirk.. There is is. The cute thing is that they are always quite proud of their tree and usually send me a picture. This year was no exception. My mother says it's a Hawaiian pine, but a quick Google search doesn't turn up anything that resembles the above. Plus there is almost a full dozen ornaments on that thing. It's a marginal step up from the festivus pole. Note the ceramic dog by the window, my parents go all out with holiday decorating, I told mum she might have overdone it this year. But hey, they are retired and if a festive fern makes them happy, bring it on.